Training for your first 10 km run? There are more than a few things to consider. When you first start at the gym, you wouldn’t pick up a bar loaded with 100kg for a deadlift, as you will most likely hurt yourself, correct? You have to have the right knowledge, equipment and direction to do it safely and to get the most benefit from the exercise. What most people don’t understand, it is the same process for running. Generally, people start running to either get fit, lose weight or to compete in an event like the Gold Coast Marathon. Old shoes will be thrown on or they will walk into a fitness store and buy the latest trend. New runners will hit the local footpath and bust out their hardest and fastest run while working on getting further and further every time. Most will pull up the next day or two walking around feeling as if they are a pensioner. They are also more prone to create an injury or have an existing one return, therefore stopping running altogether. Like anything new in life, mainly exercise, it requires education, investment, patience and consistency. As a coach with 12-years experience, I too made the mistake of not taking the correct advice from the right people. Every year I would sign up for the Gold Coast Marathon, give myself a month to bust out to complete some decent training and compete. A couple of years ago this led to painful shin splints and hamstring injuries. I had to have time off training and invest in my physio to put me back together. Having time off was both frustrating, expensive and unnecessary. These are my recommendations for being successful when first starting out running, or even getting back into it. Successful doesn’t mean to come first, to beat your PB, lose weight or get fit. It merely means to participate by not becoming injured so you can continue enjoying a very healthy and cost-effective fitness activity. Are you under the impression that your shoes should last a few years until they are torn with your toes coming through the top. Do you also believe that the latest pair of Nikes is the best ones for you, or that all shoes are equal? I disagree with all of the above. Footwear is your support and stability. A person’s shoes should stop unnecessary pressure on your back, knee and ankle joints. It is so important to be correctly fitted to your foot shape and the particular activity that you will be completing. If you were on a building site you wouldn’t wear thongs; you would invest in steel cap boots to protect your feet. Same goes for running shoes, shoes for strength training and shoes for the gym. Personally, I have a pair of shoes just for running. I would recommend a store that specialises in running shoes such as The Athletes Foot, this way you will be fitted correctly and receive expert advice. For strength training, I believe that Nike Metcons give the most support. Then those old running shoes keep them for general gym wear, bushwalking or heading out for the day on the weekend. It’s very common to get injured after a month or so of running due to weakness and imbalances. When people first start running they feel great; however many make the mistake of skipping the strength training, in turn, this creates the risk of an injury to occur. I would recommend getting a coach to help and asses the way you move during the exercise. It’s not always about fixing but aiming to be strong and progressing. Typical areas of weakness include glutes, VMO & amp, middle back posture muscles and one side of the body can tend to be stronger than the other. These can all be strengthened with the right exercises performed correctly. Don’t continue running with an injury. Running can be hard on the body and running with a real niggle can lead to further issues down the track. Go easy and pace yourself. When you first start running don’t hit your max effort straight away. I have made this mistake of going all out with no preparation, and it can lead to many injuries as I mentioned above. Start, so you have more in the tank, this can often be referred to as metabolic running. A metabolic pace is one that you could continue running and never get out of breath. After a few months build up your pace and distance. You can monitor this with a simple watch timer or an app on your phone. A good example will be to start at the rate of 7.5 minutes per km for 3-5km ( or whatever keeps you in breath). Then after a month reduces it to 7 minutes per km, from there reduce it for the next month, then finally reduce it again and increase the distance. If you did this for a year you would not only feel a dramatic change in your fitness, your body shape would have changed for the better, and you will be running 10km with no problems. For the ladies, metabolic running is a great fat burner as well. 4. Fuel and hydrate correctly. Fueling your body with a protein, plant-based, whole food diet is going to give you lots of energy and nutrients. Your diet will not only help you through your run but most importantly aid your recovery and prevent you from injury. The faster and more efficiently your body can recover, the more you are going to want to train. There are several ways to eat around your running, depending on your goals. For me, straight after my run, I will have protein and vitamin C mixed with water. Following that, I will most likely have some fruit (I recommend pawpaw or a banana). Just like any training you want to carry less body fat and higher lean muscle, so your body is efficient, lighter and stronger. Running will generally make you very tight. Having a tight body will eventually lead to some form of injury. Sadly, stretching is the most uneducated, most overlooked pre and post-work activity. I cannot stress enough that you have to do this. Your ankle and knee joints need to be warm, your hips and hamstring need to be open, and your back and core need to be ready. Mobility and flexibility is also a must for a body that is having several workouts throughout a week. Yoga is always a go-to; I don’t love the practice; however, I understand that to enjoy and keep injury free, I need it to stay flexible, fit and pain-free. Warm up: Mobility exercises are excellent. e.g. Hamstring sweeps, lunge with a twist, Calf stretch + rotation. Run: Easy jog, easy walk. By easy, I mean by going the way you feel. As an example run to one lamp post, walk to the next. (this can also be done on the treadmill which is low impact so less pressure on the joints). Repeat for 10-15 minutes. Fuel needed; more good fats for slow, sustained energy. A great example is nut butter and veggie sticks. For a lower heart rate, more fats are being burnt so to allow for stamina; more good fats can be consumed. Stage 2: 5-12 weeks – day 1 and 2 in the same week. Mobility warm-up: Hamstring sweeps, lunge with a twist, calf stretch + rotation. This example run is where you are looking to go and build up to a longer distance. 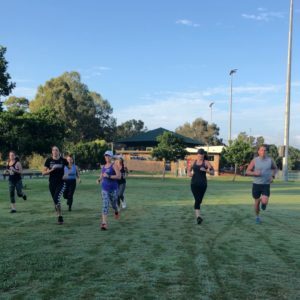 When you first start this, you can aim for 3km and build up by 500m-1km each week/month depending on your running experience and fitness. For the more experienced runner, you can run a full 7-10km at a steady pace. Nutrition for both pre and post training is the same as stage 1 above. Fuel needed, more fruits veg and carbs. As an example a banana with honey, or almond butter on rice cakes or BCAA. For a higher heart rate, more carbs are burnt so eating this will give you the energy to get through the training. I hope that no matter where you are at with your running or if you are looking to start, that this article has been helpful. I have a running coach and a myotherapist, that tunes me up, that I would happily recommend to anyone that wants or needs it. I have seen a few in my time, and these guys are the real deal. I do, and support, strength training twice a week and I have a macronutrient nutrition plan that I stick to according to my goals and body fat index. If you need any help in those areas, these are services that we can provide within our gym. Please feel free to contact us for any further information.